Squirrels can cause a lot of damage in plant containers and the garden. This guide is about keeping squirrels from digging in plants. During the summer, I plant vegetables in containers and keep them on my deck. In the past, I've had a great deal of difficulty keeping the squirrels from digging up my new sprouts. A friend gave me an idea which has worked well. What you do is get a package of bamboo skewers, which usually runs about a dollar, and stick the skewers into the soil, with the points sticking up out of the soil and over the edge of the pot. This deters the squirrels from climbing into the pots to dig up the seedlings. It's worked very well, no squirrels have been injured, and my vegetables are allowed to flourish. I have lost hundreds of dollars and many man hours due to squirrels digging in potted plants. I would come home from work only to find many pots knocked off a wall or bench. The plants, sometimes expensive, would be lying beside the pots with roots having been exposed to hot sun all day. Many plants could not be salvaged. In the picture, the pot on the right shows what I've had to resort to in order to keep the squirrels at bay, mounding the pots high with small rocks. Moving large pots with all those rocks was quite a chore. The pot on the left shows an experiment I started today. 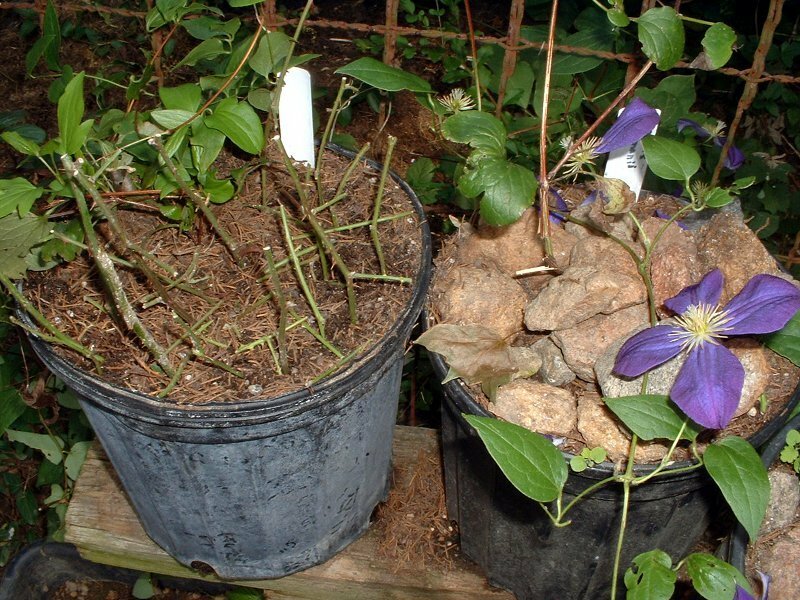 I have cut blackberry vines covered with merciless thorns into small segments and placed them very close together in the top of the pot, sticking up in the soil and lying down on the soil. There's no way a little paw can dig in the pot without encountering many thorns. As I said, this is an experiment I started today. If the vines prove to be an effective squirrel deterrent, I will post back with the good news. Don't bother with the tip about scattering moth balls. I did this and next morning, they were all GONE. The squirrels must have loved them. My face fell a mile. Ha Ha. If you have pets or animals that roam your area try adding chicken wire under your plants. This way if something tries to dig in your garden or flower beds, it will stop them in their tracks. Most animals who dig do not like the feeling they get when they scratch their paws along the wire. It also serves a dual purpose - it acts as a grid for planning your plantings! I tried to plant seeds and then actual plants in my porch flower boxes. The squirrels keep digging them up and destroying them. I live across the street from a park. I tried putting mesh on top of the soil, I tried moth crystals, no help. Anybody got an idea? Planting season is soon here in Milwaukee and I want some flowers. I understand your frustration, but since 2006, squirrels around the world have been going hungry because of weather disturbances/out of phase resulting in little or no nut crops. They are starving. In 2006 it happened in Poland, Russia, and I think it was last year or year before all along Eastern seaboard here as well as more westerly from there.They even attacked a dog, and here, were digging in garbage cans, etc. squirrel chaos, but I feel sorry for them. I use Twirlers from Kmart, the kind kids use to play with. They go around when wind is blowing, like windmills. I also save the tops that come on large cans that look like foil. Hang it in the garden. Or just use foil you have in the kitchen. Also, hot pepper sauce will do the job. I've used plastic forks to keep chipmunks out of my planters. Just push the fork in the soil, handle first, so the tines of the fork are just under the soil. You won't be able to see them, but the squirrels will get a poke as soon as they start to dig. It doesn't stop them from eating them, but it will keep them from uprooting them. We have used cayenne pepper for most of the critters who visit us. It keeps the critters away and doesn't hurt the plants. Just sprinkle a generous amount around and see if that does it. Also works for deer. There is a product called Ropel. As long as it in nothing you plan on eating you spray the plants. Various pepper sprays are suppose to also work but I have never had the same luck as I do with Ropel (I use it professionally). What do I do if the squirrels seem to like the pepper I've been putting down? I'm trying to get my coleus plants to thrive this year, and now that I realize squirrels have been digging holes in them and eating the roots. I know it's not me that killed them in the past. So, how do I keep them alive this time around? The goofy squirrels around me seem to like black pepper! I didn't have red pepper so I used black over and over and over. It's weird, but they seem to actually like some of the coleus plants over the others (different colored ones). Any help would be welcome. I don't want to hurt them so the least invasive methods please. The day before yesterday I planted over 50 sunflower seeds against our fence post in the back yard. Later that day and the next morning I noticed a squirrel over by the fence. I checked and do you know he dug up and ate all of my sunflower seeds all down the row of the fence. They were all cracked open and just laying there. My mom said, because we have them on hand to stake some disposable red plates just around the line of the seeds when I plant them until they sprout. Will this work? Any suggestions will help, because of course I want to plant more, but not for the squirrel to eat. Do they watch you do this or do they actually smell the seeds underground? Help. After you plant the seed put some hot pepper sauce on top of the soil,also hang some foil near them, keep the soil damp, keep a watch for them. I keep 2 cans near the door outside, when I see critters near my garden I beat the cans together, they run away. I also keep some twillers (looks like windmills)in my garden. They go around when the wind is blowing, good luck. Go to a hardware store and buy some chicken wire. Spread the wire over the area that has the seeds. Anchor the wire with some rocks. When the plants start to grow remove the wire. I had the same problem last year, the squirrels kept eating them and I kept replanting. Then I used the chicken wire and anchored it with tent stakes. I shaped it into arches so the plants could get a little growth before I removed it. It's hard to tell but they are about 3 inches here. With some of the wire arches I bent the ends down and others I put big rocks on the end to keep the squirrels out. They will try their best to get in so you have to make sure it is secure. When squirrels ravaged my seeds and plants, I put cat hair in and on the ground, and attached some to the plants. It kept the squirrels away for a good while. Dang squirrels! I have had the same problems! I planted 75 Gladiola bulbs and every one was dug up and eaten! My 75.00 market umbrella eaten, the 200 and something dollar gazebo on my deck had a skylight eaten out of the center! Tablecloth eaten! My Mom told me to do the chicken wire for the gladiolas & I think I remember hearing about sprinkling cayenne pepper? The damage that was done last year drove me to the point of trapping and relocating! In 2 months we relocated 21 of the little buggers! I am also told you have to go at least 10 miles away or they will come back! Sprinkling cayenne pepper over the area should deter them. That has worked for me in all but one circumstance. That was a little pot of cactus plants on my front porch, and even though they often hurt themselves enough to bleed, even cayenne pepper didn't deter them enough to keep them from going back to dig, and get hurt again! LOL Try the cayenne pepper, and remember to re-apply if it rains, or if you water, and also after some days have passed. The squirrels will still go after them, even after they've sprouted, so don't stop too soon! Just have to add a funny story to this. Several years ago we were feeding the birds and along came a chipmunk and stole all of the sunflower seeds from the bird seed. Lo and behold about two weeks later I had all these sprouts coming up in my garden all over the place. At first couldn't figure out what was growing in my garden since I hadn't planted anything new. Apparently the chipmunk buried all of the sunflower seeds he collected in my garden. I had the most wonderful sunflowers that year. Squirrels come onto my patio and dig dirt out of my plant/flower pots. How can I keep them from doing that? I know they like to dig (ground squirrels), but why my flower pots? This is the second year in a row. The squirrels are destroying my plants by digging in all the pots. Anyone have any methods to preclude this? What can I purchase to stop squirrels from digging up all of my plants? I need the name of a product and where it can be purchased. Why don't you go to the hardware store and buy a roll of chicken wire and spread it over the area in question? You can anchor it down with some rocks. That way you don't have to use chemicals and sprays. Forget the moth balls. They don't work. What is the best way to deter squirrels from digging up flower pots and gardens? How do I keep squirrels out of potted plants on the patio? I have a balcony one floor up from the ground. There are trees on either side, and the squirrels climb up them, then onto a ledge, then onto my balcony where they dig in my flower pots and eat through the wire on my string lights. I bought tall planters which stopped them for a while, and now they've figured how to get into those and dig and kick the dirt all over the balcony. I'm wondering if there is some sort of a shield that can be attached to the trees that might have barbed wire or some other pointy/ouchy surface that would deter the little brats. Any ideas? 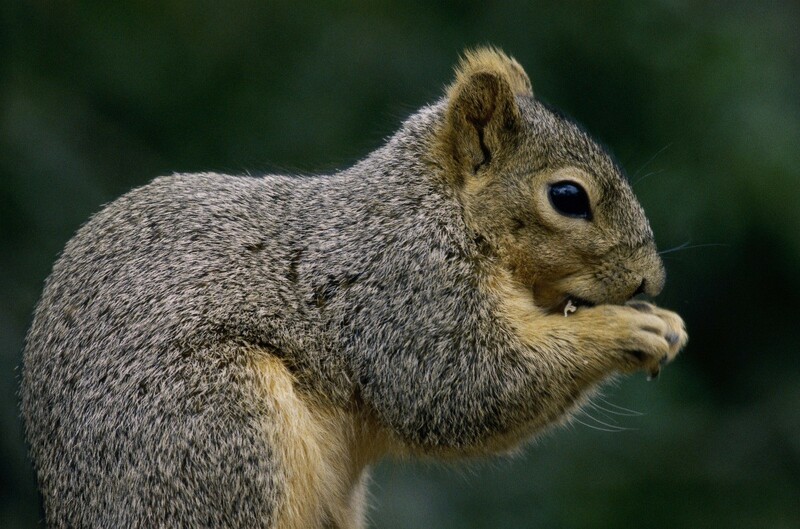 You may want to keep squirrels out of your garden or bird feeders. 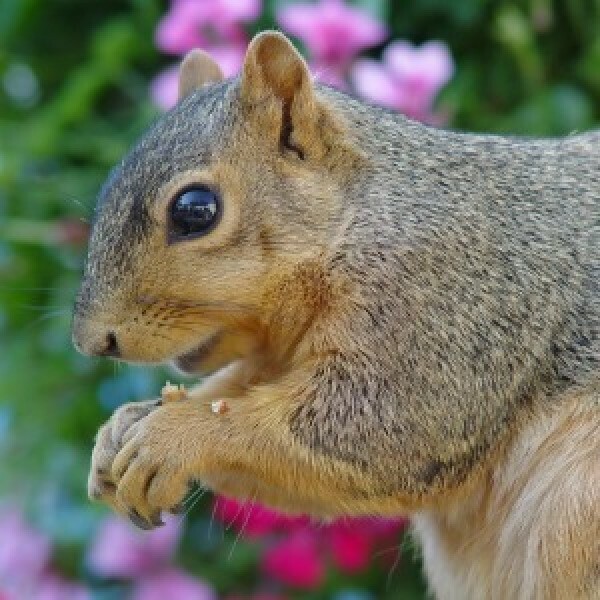 This is a guide about natural repellent for squirrels. 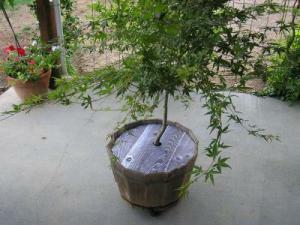 Q: How can I keep squirrels from digging in my outdoor potted plants? You might try fitting screen or wire mesh around your potted plants, or covering the dirt around plants with sticky tape or stones. Squirrels seem most attracted to digging in loose, newly turned dirt so follow up with a top layer of mulch. Lure them away from potted plants and bulbs by feeding them corn or sunflower seeds in a feeder located in another part of the yard. 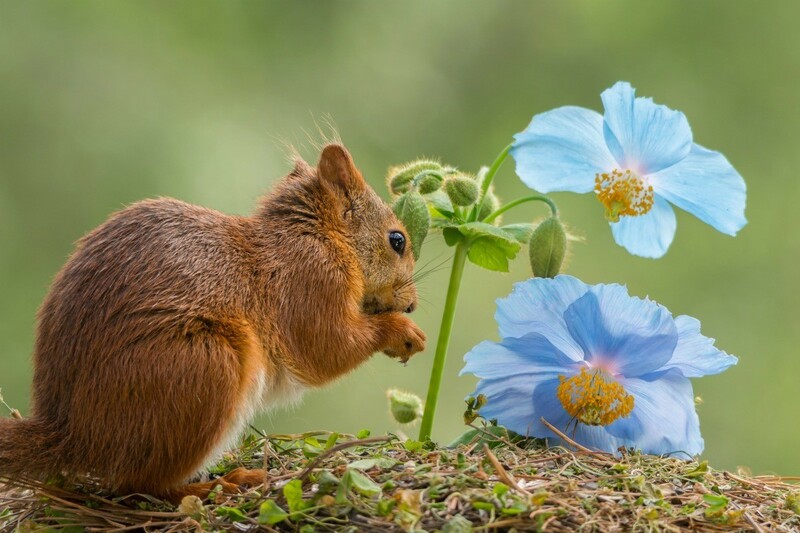 This can ultimately result in an increase in the population of squirrels in your yard, but the distraction of the constant food supply is also a good distraction. Try laying human, dog or cat hair around the base of your potted plants. Blood meal may also work in some cases. To be effective, these will need to be reapplied weekly and after it rains. Spray a foul-tasting product, like cayenne pepper spray on and around your plants as they are growing and after each rain. Plant bulbs that squirrels don't like to eat, like narcissus, alliums (ornamental onions) and hyacinths. If all else fails you can live-trap them and relocate them. You'll need permission from authorities to do this, however, and it will not reduce the density of squirrels in your area over time. As old squirrels are transported out, new squirrels simply move into the newly emptied habitat. Since the squirrel population is likely to outlive your potted plants, your best bet is to deploy a number of these methods, alone or in combination with one another until you find something that works. Plan on having a few victories and probably a few defeats. Is there a home remedy I can use to keep squirrels from eating the plants in my garden?